Once again, I am indebted to the German homeopathy lobbyist, Jens Behnke (research officer at the Karl and Veronica Carstens-Foundation); this time for alerting me via a tweet to the existence of the ‘Institute for Scientific Homeopathy’ run by Dr K Lenger. Anyone who combines the terms ‘scientific’ and ‘homeopathy’ has my full attention. If that is not noteworthy, what is? This website, for instance, explains that Lenger Karin Dr.rer.nat., pursued Diploma in Biochem, studied Biochemistry at the Universities of Tubingen and Cologne. Her research topics revolved around enzymatic gene regulation, cancer research, enzymatic mechanisms of steroid hormones at the Medical University of Lubeck. In 1987 she became a Lecturer for Homeopathy at DHU ((Deutsche Homöopathie Union = German Homeopathy Union). Since 1995 she worked as a Homeopathic Practitioner and developed the “biochemical homeopathy” by using highly potentized substrates of pathological enzymes for her patients. She detected magnetic photons in high homeopathic potencies by two magnetic resonance methods and developed a model of physical and biochemical function of homeopathy. Karin Lenger detected magnetic photons in highly diluted and potentized homeopathic remedies. Since the living body is an electromagnetic wavepackage (Einstein), the homeopathic law of Similars (Hahnemann 1755-1843) can be expressed as: the frequencies of the patient must match the frequencies of the remedies. Homeopathy is a regulation therapy curing hypo and hyperfunction of a pathological pathway by resonance: highly potentized substrates, inhibitors, enzymes, receptors of the distinct pathological pathways cure according to biochemical rules: A homeopathic symptom picture is obtained by poisoning a volunteer with a toxin. Simultaneously he develops psychological symptoms, the toxicological pathway and e.g. frequencies I-V. The highly potentized toxin has the frequencies I-V. The patient has symptoms as if he was poisoned by the toxin: during his illness he developed the toxicological pathway, frequencies I-V and psychological symptoms. The potentized toxin cures simultaneously the patient’s frequencies by resonance, his pathological pathway and the psychological symptoms. A stitch of honey bee, apis mellifica, causes a red oedema; a patient developing a red oedema at the finger-joint by rheumatism is cured by highly potentized Apis mellifica. Paralyses caused by a lack of the neurotransmitter acetylcholine bound to the acetylcholine-receptor at the post-synapsis can be healed by using these potentized remedies: the venom of cobra, Naja tripudians containing the receptor’s irreversible inhibitor cobrotoxin, the reversible inhibitor Atropine and Acetylcholine, daily applied. The availability of acetylcholine is maintained by glycolysis and fatty acid oxidation. This can be supported by giving these remedies: Lecithin, Lipasum, Glycerinum, Glucosum and Coenzyme A.
Homeopathy, a holistic therapy, is believed to cure only acute symptoms of a beginning illness according to the Laws of Similars; but not deep, bleeding, septic wounds. The homeopaths refuse to heal according to special medical indications. Based on Lenger’s detection of magnetic photons in homeopathic remedies a biochemical and biophysical model of homeopathic healing was developed Biochemical, pathological pathways can be treated by their highly potentized substrates and inhibitors. Three groups of patients with moderate, severe and septic wounds had been successfully treated with the suitable remedies depending on the biochemical pathological state. Do I sense a Nobel Prize in the offing? Is 2018 the year when research into homeopathy died a natural death? Medline is the biggest electronic databank for articles published in medicine and related fields. It is therefore the most important source of information in this area. I use it regularly to monitor what new papers have been published in the various fields of alternative medicine. 29 were comments, letters, editorials, etc. the rest of the articles was not on homeopathy at all. I find this pretty depressing. Most of the 100 papers turn out to be no real research at all. Crucial topics are not being covered. There was, for example, not a single paper on the risks of homeopathy (no, don’t tell me it is harmless; it can and does regularly cost the lives of patients who trust the bogus claims of homeopaths). There was no article investigating the important question whether the practice of homeopathy does not violate the rules of medical ethics (think of informed consent or the imperative to do more harm than good). And a mere 5 clinical trials is just a dismal amount, in my view. In a previous post, I have already shown that, in 2015, homeopathy research was deplorable. My new analysis suggests that the situation has become much worse. One might even go as far as asking whether 2018 might turn out to be the year when homeopathy research finally died a natural death. Herbal suppositories for bacterial vaginosis? Bacterial vaginosis is a common condition which is more than a triviality. It can have serious consequences including pelvic inflammatory disease, endometritis, postoperative vaginal cuff infections, preterm labor, premature rupture of membranes, and chorioamnionitis. Therefore, it is important to treat it adequately with antibiotics. But are there other options as well? There are plenty of alternative or ‘natural’ treatments on offer. But do they work? The patients (63 in metronidazole group and 64 in Forzejeh group) received the medications for 1 week. Their symptoms including the amount and odour of discharge and cervical pain were assessed using a questionnaire. Cervical inflammation and Amsel criteria (pH of vaginal discharge, whiff test, presence of clue cells and Gram staining) were investigated at the beginning of the study and 14 days after treatment. The amount and odour of discharge, Amsel criteria, pelvic pain and cervical inflammation significantly decreased in Forzejeh and metronidazole groups (p = <.001). There was no statistically significant difference between the metronidazole and Fozejeh groups with respect to any of the clinical symptoms or the laboratory assessments. The authors concluded that Forzejeh … has a therapeutic effect the same as metronidazole in bacterial vaginosis. The plants in Fozejeh are assumed to have antimicrobial activities. Forzejeh has been used in folk medicine for many years but was only recently standardised. According to the authors, this study shows that the therapeutic effects of Forzejeh on bacterial vaginosis is similar to metronidazole. Yet, I am far less convinced than these Iranian researchers. As this trial compared two active treatments, it was an equivalence study. As such, it requires a different statistical approach and a much larger sample size. The absence of a difference between the two groups is most likely due to the fact that the study was too small to show it. If I am correct, the present investigation only demonstrates yet again that, with flawed study-designs, it is easy to produce false-positive results. How often do we hear this sentence: “I know, because I have done my research!” I don’t doubt that most people who make this claim believe it to be true. 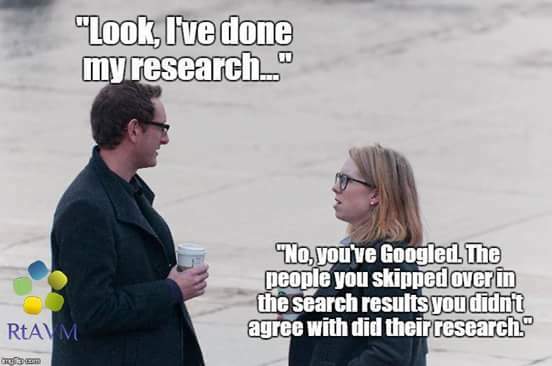 What many mean by saying, “I know, because I have done my research”, is that they went on the internet and looked at a few websites. Others might have been more thorough and read books and perhaps even some original papers. But does that justify their claim, “I know, because I have done my research”? The thing is, there is research and there is research. The dictionary defines research as “The systematic investigation into and study of materials and sources in order to establish facts and reach new conclusions.” This definition is helpful because it mentions several issues which, I believe, are important. repeating the conclusions of others. Obviously, I am being very harsh and uncompromising here. Not many people could, according to these principles, truthfully claim to have done research in alternative medicine. Most people in this realm do not fulfil any of those criteria. and there is a common usage of the word. But what I do mind, however, is when the real research is claimed to be as relevant and reliable as the common usage of the term. This would be a classical false equivalence, akin to putting experts on a par with pseudo-experts, to believing that facts are no different from fantasy, or to assume that truth is akin to post-truth. Sadly, in the realm of alternative medicine (and alarmingly, in other areas as well), this is exactly what has happened since quite some time. No doubt, this might be one reason why many consumers are so confused and often make wrong, sometimes dangerous therapeutic decisions. And this is why I think it is important to point out the difference between research and research. On this blog, we constantly discuss the shortcomings of clinical trials of (and other research into) alternative medicine. Yet, there can be no question that research into conventional medicine is often unreliable as well. What might be the main reasons for this lamentable fact? Firstly, much research fails to address questions that matter. For example, new drugs are tested against placebo rather than against usual treatments. Or the question may already have been answered, but the researchers haven’t undertaken a systematic review that would have told them the research was not needed. Or the research may use outcomes, perhaps surrogate measures, that are not useful. Secondly, the methods of the studies may be inadequate. Many studies are too small, and more than half fail to deal adequately with bias. Studies are not replicated, and when people have tried to replicate studies they find that most do not have reproducible results. Thirdly, research is not efficiently regulated and managed. Quality assurance systems fail to pick up the flaws in the research proposals. Or the bureaucracy involved in having research funded and approved may encourage researchers to conduct studies that are too small or too short term. Fourthly, the research that is completed is not made fully accessible. Half of studies are never published at all, and there is a bias in what is published, meaning that treatments may seem to be more effective and safer than they actually are. Then not all outcome measures are reported, again with a bias towards those are positive. Fifthly, published reports of research are often biased and unusable. In trials about a third of interventions are inadequately described meaning they cannot be implemented. Half of study outcomes are not reported. Apparently, these 5 issues are the reason why 85% of biomedical research is being wasted. That is in CONVENTIONAL medicine, of course. Much research fails to address questions that matter. That is certainly true for alternative medicine – just think of the plethora of utterly useless surveys that are being published. The methods of the studies may be inadequate. Also true, as we have seen hundreds of time on this blog. Some of the most prevalent flaws include in my experience small sample sizes, lack of adequate controls (e.g. A+B vs B design) and misleading conclusions. Research is not efficiently regulated and managed. True, but probably not a specific feature of alternative medicine research. Research that is completed is not made fully accessible. most likely true but, due to lack of information and transparency, impossible to judge. Published reports of research are often biased and unusable. This is unquestionably a prominent feature of alternative medicine research. All of this seems to indicate that the problems are very similar – similar but much more profound in the realm of alternative medicine, I’d say based on many years of experience (yes, what follows is opinion and not evidence because the latter is hardly available). The thing is that, like almost any other job, research needs knowledge, skills, training, experience, integrity and impartiality to do it properly. It simply cannot be done well without such qualities. In alternative medicine, we do not have many individuals who have all or even most of these qualities. Instead, we have people who often are evangelic believers in alternative medicine, want to further their field by doing some research and therefore acquire a thin veneer of scientific expertise. In my 25 years of experience in this area, I have not often seen researchers who knew that research is for testing hypotheses and not for trying to prove one’s hunches to be correct. In my own team, those who were the most enthusiastic about a particular therapy (and were thus seen as experts in its clinical application), were often the lousiest researchers who had the most difficulties coping with the scientific approach. For me, this continues to be THE problem in alternative medicine research. The investigators – and some of them are now sufficiently skilled to bluff us to believe they are serious scientists – essentially start on the wrong foot. Because they never were properly trained and educated, they fail to appreciate how research proceeds. They hardly know how to properly establish a hypothesis, and – most crucially – they don’t know that, once that is done, you ought to conduct investigation after investigation to show that your hypothesis is incorrect. Only once all reasonable attempts to disprove it have failed, can your hypothesis be considered correct. These multiple attempts of disproving go entirely against the grain of an enthusiast who has plenty of emotional baggage and therefore cannot bring him/herself to honestly attempt to disprove his/her beloved hypothesis. The plainly visible result of this situation is the fact that we have dozens of alternative medicine researchers who never publish a negative finding related to their pet therapy (some of them were admitted to what I call my HALL OF FAME on this blog, in case you want to verify this statement). And the lamentable consequence of all this is the fast-growing mountain of dangerously misleading (but often seemingly robust) articles about alternative treatments polluting Medline and other databases.